So we really thought today was going to be a good day. It wasn't that it was "bad" but it wasn't good either. Reagan was OK, but still very tense in her body. And sensitive. Very sensitive. Too sensitive to even think about attempting putting on her Cleopatra costume and going trick or treating! We had her in her pink Gymboree skeleton pjs (which apparently many kids were wearing as costumes this year), but when we brought her downstairs and put her into her stroller, she got increasingly kooky and we knew it wasn't meant to be this year. She hung out downstairs with Daddy while Grandma (dressed as the guy from scream) was outside sitting in the driveway handing out candy! 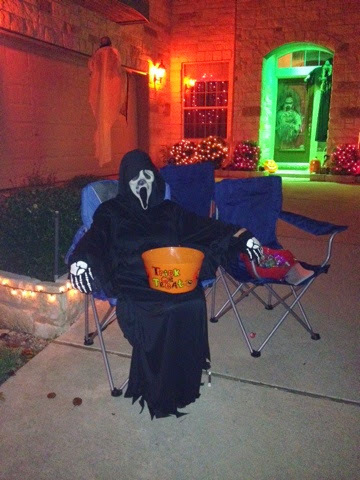 She would just sit there, with the candy bowl on her lap, waiting for a kid to reach in and then she'd grab their hand! Needless to say, there were lots of screams coming from our house! We attempted to take Ryan out for a bit (dressed as a UPS man), but he was still feeling a bit under the weather, and was in meltdown mode so we didn't last long. Our house was a big hit though! Everyone loved all of the decorations and lights! 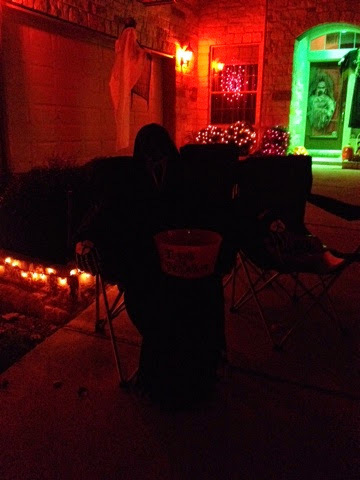 Although some kiddos were too afraid to come to the front door, so that's why we had to sit in the driveway (and scare them there)! It's too bad both kiddos were "off". It's been years since Reagan had a good Halloween! Oh well, we'll shoot for a good Christmas! 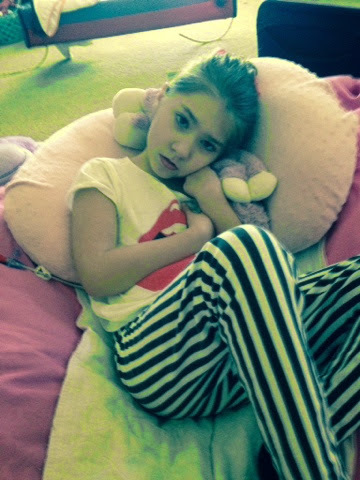 It's been an awful day for my girl! It all started last night. She was fighting going to sleep and getting more and more aggravated. She flipped out and ended up spending the night in her chair. I don't think she slept much at all. I got up a few times with her when she was upset, but most of the night I think she was just kicking around quietly but awake. She seemed to calm down a bit and there was a period of time this morning we thought she might actually be OK. I picked her up and held her and she was even giving me some laughs! But not long after that, she started crying and then cried nearly the entire day. Her medications were not very helpful today, giving her brief if any relief from the pain. We've had to use her restraints off and on today as well. She's been very bitey and at one point she did get a hold of her right finger (because we were holding her left hand). This is way too soon to be having bad days again already, but I'm just praying it comes and goes as quickly as we've seen the last few cycles. Hopefully she'll get some sleep tonight and wake up feeling much improved tomorrow! She just has to right, because she can't feel much worse! Prayers for our sweet girl are much appreciated! Reagan slept well last night and woke up around 6:45am. She was sweet and smiley...definitely more happy than previous days. She's been giving us laughs and smiles all day today! 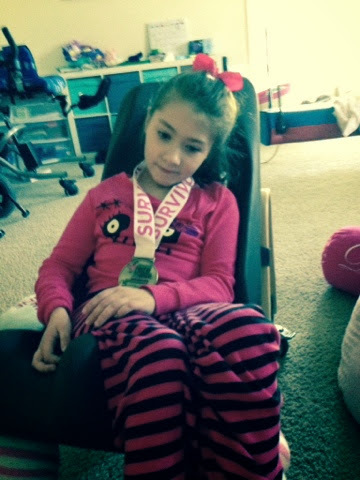 She had a busy day of therapy with PT in the morning, followed by vision/speech through the school, and then OT! Busy, busy! She did really well with everything and has just been a super sweet girl nonstop. Still very relaxed in her body. She's been sleepy off an on throughout the day, but never really dozed off. Tonight especially she keeps closing her eyes and then popping back awake with a giggle! Hoping she can doze off for good and get a good night's sleep tonight and give us another good day tomorrow! I'm really hoping she holds out and has a good day for Halloween, but her last couple of cycles have been much shorter so we're definitely on borrowed time! Prayers for my sweet girl to hang on! Reagan slept well again last night. Woke up a little early...was awake when I got back from my walk...but she was good. Still a little serious. She had another poo on her own this morning! I know that's a lot of poo talk but hey, we get excited about that around here! It's nice to see her going on her own on a regular basis (3 days in a row). She definitely loosened up a bit as the day went on. All in all, she was pretty calm and content today. Still a little spitty, hands in the mouth a lot. 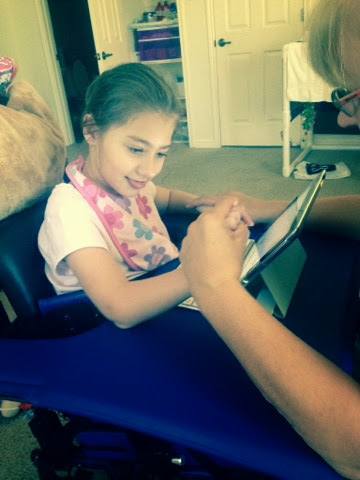 She had speech this morning (was making a lot of choices), OT this afternoon (did some time in the stander), and then school late this afternoon (very visually attentive but still very into her hands). She's been a good girl. Laid back, go with the flow. Not super happy, but content, so that makes us happy. Reagan slept well last night (in her bed) but woke up fairly early this morning. She was calm but serious. Not many smiles today. An occasional laugh if we worked really hard for it. She had a bit of a gurlgly tummy and even had two dirty diapers on her own! As the day went on she got more and more spitty and was even a little chokey at times, but no real nausea to speak of. Tonight she was looking sleepy so I picked her up to try to get her to fall asleep in my arms, but she was getting a little too chokey in that position. She did eventually doze off on her own and Daddy moved her successfully to her bed. Hoping for another good night's sleep for my girl and good day tomorrow! 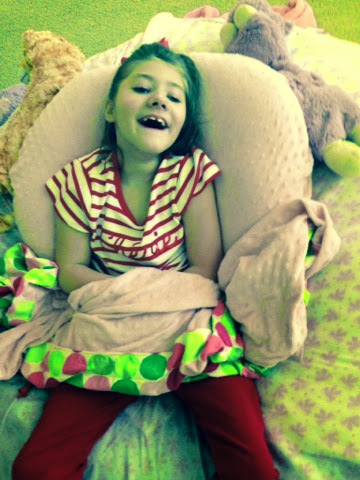 We're so thankful Reagan slept last night and woke up this morning feeling much improved! 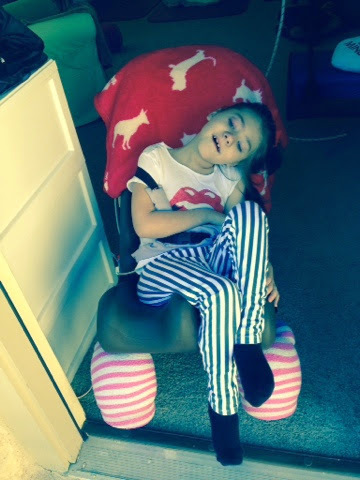 This morning we found her completely sideways in her chair, but still asleep. When she woke up, she had a scowl on her face and was very serious, but no longer upset or crying! She had a pretty good day today...all things considered. She's been pretty mellow and dozing off and on all day. We'll take that over crying and miserable any day! She dozed off on her own so we're hoping she sleeps well and wakes up feeling even better tomorrow! It was a bad day today. My girl slept well and even slept in a little this morning. But when she woke, she was not happy. She was very tense, whining, and stressed! Unfortunately it just continued to get worse! She started crying and biting and flailing...we couldn't control her. She managed to pull her hand away from her nurse and took a little bite out of her pointer finger. For the rest of the day she had to wear an arm restraint on her left arm...for her safety! The only positive thing, she was responding well to pain medication. We alternated clonidine and Lortab/oxycodone all day and she slept through most of the bad. It wasn't until tonight that she had a longer stretch of misery where she wasn't responding to medication. Finally she dozed off on her own and were just praying she'll sleep well and wake up better tomorrow! Please keep her in your prayers! These bad days are coming way too quickly! Reagan woke me up around 4am this morning. I went in and checked on her, covered her back up, and went back to bed. When I got up at 5:30am, she was back asleep. When I got back from my run, she was awake again (probably due to the dirty diaper she was sporting)! I changed her and moved her to her therapy room and she was all smiles! She's been smiley and wonderful all day again today! Super sweet, but also super spitty! Not at all gaggy (although a little chokey at times), but definitely a steady drip! She had PT and OT today and did great with both. Loving these good days for my girl! Prayers that they continue! It's been another good one for my girl! She's been very smiley and sweet today. She had speech and school today and did great for both. She's been a little spitty tonight but super good. Cuddly and sweet, I sure love loving on this girl! It's been another good one. Reagan was a little hesitant to fall asleep once in her bed last night, but she eventually dozed off with clonidine. She slept through til about 5am and then was awake for a bit. She fell back asleep but a loud motorcycle driving by woke her back up and then she was wide awake! Thankfully, she was super sweet and smiley! She's been super precious today. She had PT this morning and did great for that. She was doing great kneeling and doing switch work so her PT got a little over excited and continued it probably a little longer than she normally would have. After that she was pretty zonked. She'd do it again, but not for nearly as long! I know with all of her nonstop movement, we never really think about her body fatiguing, but as any kid with mito, she's going to tire much more easily. This afternoon she had OT and did a great job for that as well! 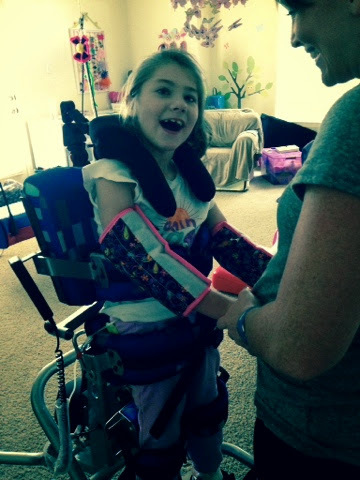 She sat in her wheelchair and they worked on her head control (so she didn't use her i2i headrest). They've been doing this a lot lately and her head control has improved significantly. She still fatigues after a while, but it's way better than it used to be! Everybody is loving the sweetness and smiles this girl is giving us today! She's been biting her lower lip and grinding her teeth off and on, but otherwise she's been perfect! Definitely praying for more good days to come! Reagan had a good day today! She woke up a little early, but she was a good girl! She's been very sweet and smiley all day! 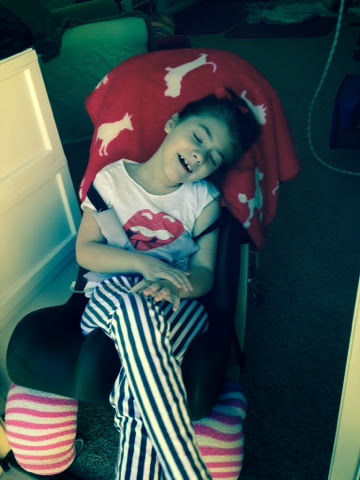 She's had a busy day of therapies...vision/speech this morning (she was very vocal and "talking" the whole time), OT shortly after (and even got in her stander), and then "school" this afternoon. She did great for them all! She has really made quite the recovery after such a horrendous day on Saturday! The only thing I've noticed that's still a bit off, she's getting the "one red ear" off and on (it's her right ear), which is an indication of dysautonomia. She's also kicking a lot and has her hands shoved down her throat, but that's not unusual for her! Tonight I made her sit cross-legged in her chair and that really helped to settle her and she was able to stop the constant movement for a bit! I leaned over her and put my head on her head and she dozed off! She's such a doll! Love that girl! Hoping she has a good night's sleep tonight and has another good day tomorrow! Reagan slept last night and kept sleeping this morning! We went to church and came back and she was still asleep (her nurse was here with her)! She woke briefly while we were gone and seemed a bit agitated, but fell back to sleep. 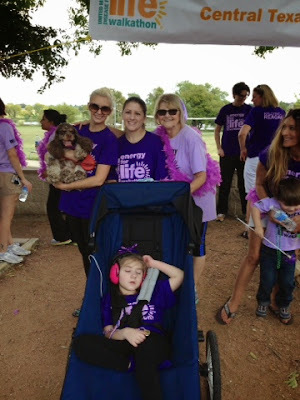 We were pressed for time when we got back, so we immediately started changing her to get her ready to leave for the walk (at this point we weren't even sure how she was going to wake up and if she was going to be able to go)! We woke her up, but she didn't seem to mind. She was cool and calm. 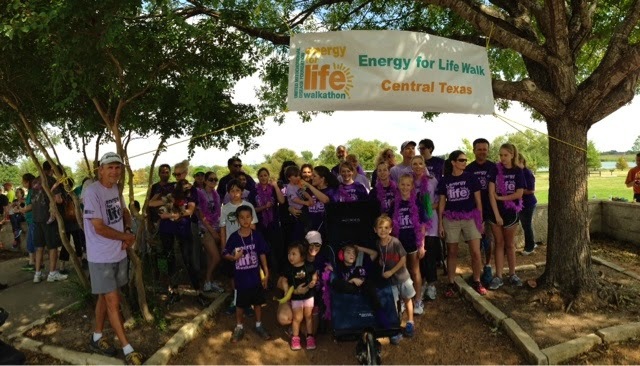 We got everyone loaded up into the car (as well as two all-terrain strollers) and headed out to Old Settler's Park in Round Rock for the 3rd Annual Energy for Life Central Texas Walkathon! Reagan was great, but the music/DJ was loud, so I immediately put on her noise cancelling head phones. The only time she seemed to be getting a little sensitive was during the national anthem, but I just talked her through it and she was fine! They even spoke to everyone ahead of time and as team "Rallying for Reagan" walked past the starting line, they turned down the music and all just shook pom poms (instead of clapping)! The weather was nice, although in the bright sunshine it did get a little warm! It was perfect sleeping weather though, so Reagan dozed off almost immediately. We had 50 or so people on our team this year so it was a really good turnout! 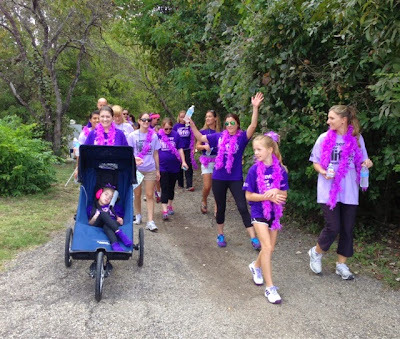 We made it through the whole walk, and pictures afterward, without her waking up. Daddy even decided it would be easiest to just walk her back down the road to the restaurant we were meeting up at, rather than taking her out of the stroller to go a mile down the road and risk her waking up. She slept through lunch and didn't wake until we put her in the car! She didn't last long though and both she and her brother were fast asleep the whole drive home! She woke up again when we brought her in the house, but fell back to sleep shortly thereafter. She woke up long enough tonight for a bath and then was back out in no time! All in all, it turned out really well (considering how bad things were yesterday)!! Thank you for your prayers and thank you everyone so much for coming out to support my girl! We couldn't do it without you! Today started off well enough...Reagan woke up surprisingly happy and we thought all was good. Boy were we wrong! 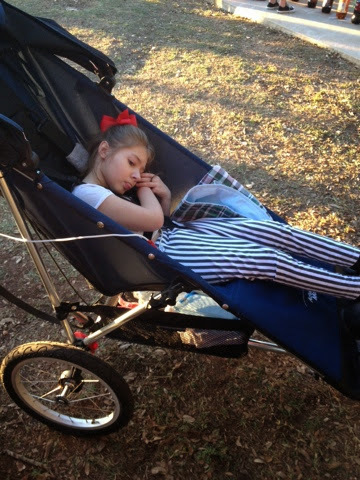 I had my second 5k in the morning, so while I was off running, Reagan dozed back off to sleep. All was good and she was sleeping away, when all of a sudden she woke up crying! And that sums up the rest of the day! Nonstop screaming crying! Her pain/sleep medicines weren't helping and she was miserable! I honestly don't remember the last time she was this bad! Biting, flailing, kicking...she had superhuman strength! We were having to use all of our body weight to try to stop her from hurting herself. Eventually we did end up having to put both arm restraints on her, because we just couldn't hold her down nonstop and she couldn't be trusted even for a second! It's been AWFUL. Grandma drove in and we all took turns trying to soothe her, but it was not working. Grandma and Daddy had a little more luck getting her to fall asleep, but not much was helping. This continued on until 1-1:30am and now she's finally asleep. No clue if it will last or if by some miracle she'll be well enough to go to the walkathon tomorrow! We could sure use some prayers for our sweet miserable girl! Goodnight. It's been another good one for my girl! 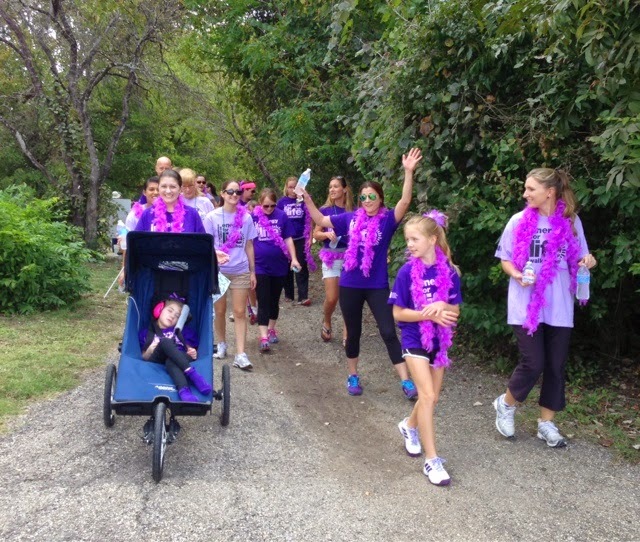 (I keep telling her she needs to hold on for THREE more days, since the walkathon is Sunday!) She woke up this morning laughing and never went back to sleep! She was super laughy this morning, but she had lots of laughs all day. 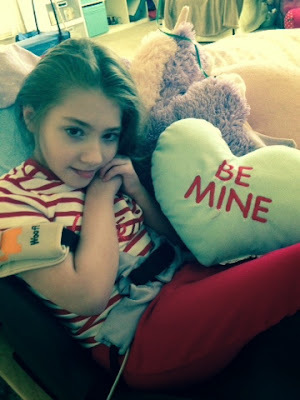 Only one therapy today, speech this morning and of course she did well with that. She was super sweet and there were many photo opportunities...she couldn't have been any cuter! Her hands and feet have continued to be cold and clammy off and on and this afternoon/night she's been particularly spitty...but still good. Tonight she did give us a bit of grief in the sleep department. She fell asleep on her own in her chair downstairs but when Mike carried her upstairs to her bed, she woke up and then wouldn't go back to sleep. She was actually getting increasingly frustrated and fussy so finally we moved her to her chair and with some coaxing (and oils diffusing) she eventually fell asleep! It definitely seemed to be tummy pain related so I'm hoping it will pass and we'll still have a sweet smiley girl tomorrow! Reagan had a pretty good day today. She started out a little serious again, but she's mellowed out as the day has gone on. She had another good session of PT. She's using a tumbleforms "raised roll" (it's flat on one side so it doesn't roll) and laying Reagan on it to help open up her back (she's always in flexion, crunching forward). Every time they do it, she completely relaxes into it, lays with her arms extended out and relaxed, and seems to love it! Her nurse is going to start doing it at least once a day, to see if it helps to get her out of crunchmode! This afternoon she had OT. 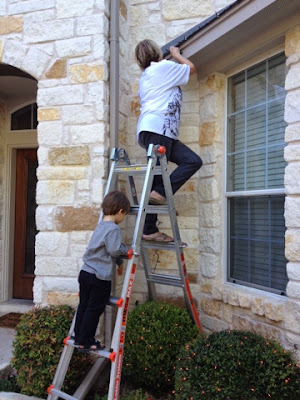 She did a lot of switch work and she's getting very good at it! She's been pretty sweet and a little laughy today/tonight. Her hands and feet are definitely cold and clammy, so I'm not sure what that's about. Tonight she was a little laughy (even as she was dozing off) but she was asleep when we laid down. Hoping she gets some rest tonight! Reagan slept well last night and woke up still a little serious today. Tense in her body. Last night when she was in bed dozing off, I noticed her doing the tensing up thing, where she kinda startles eyes open, arms stiffen, and then it takes her a bit to relax again and she closes her eyes. We've seen this move off and on for years now. It looks more seizureish than I'd like, but at the same time, her EEGs have gotten better and better, so we've tried not to worry about it. She did it again once or twice this morning when her nurse was holding her (and she was sleepy). Probably something I need to get on video, but just haven't. Reagan had speech this morning and then school this afternoon. I think she did pretty well for school, but was probably a little less interactive for speech. Tonight she was good for her nurse while we had Bible study at our house with our neighbors (she was even a little laughy). Then right around 10pm, Mike laid down with her and was able to get her to sleep! We are all ready for bed and it's only 10:45pm...an all time record! It's literally been years since we were in bed before 11 (we're rarely in bed by midnight)! Gonna go enjoy my almost 7hrs of sleep! Good night! 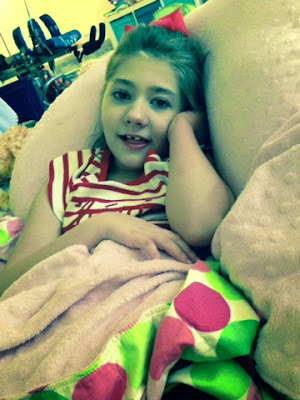 Reagan slept well last night and had a pretty good day today. Still no smiles, a few little laughs, but good. She's still very tense in her body and "crunchy"...both her PT and OT worked on that today. She also had vision therapy this morning, so it's been a busy day. She held her own though and was very patient through it all. This afternoon she got a package in the mail from Julie, her IRun4 runner. It was her survivor medal that she got from running the Susan G. Koman race for the cure race (she's a breast cancer survivor)! Such a sweet thing for her to do! And such a fitting medal for my girl to receive! 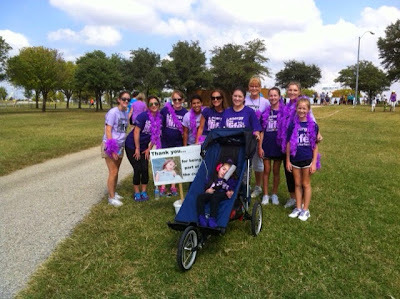 If you don't already know about it, there's a really neat facebook group called I run for Michael where they pair up runners with special needs children/adults. The runners receive a lot of support from other runners while also donating their miles to their special needs buddy! It's a great organization and everyone gets a lot out of it! 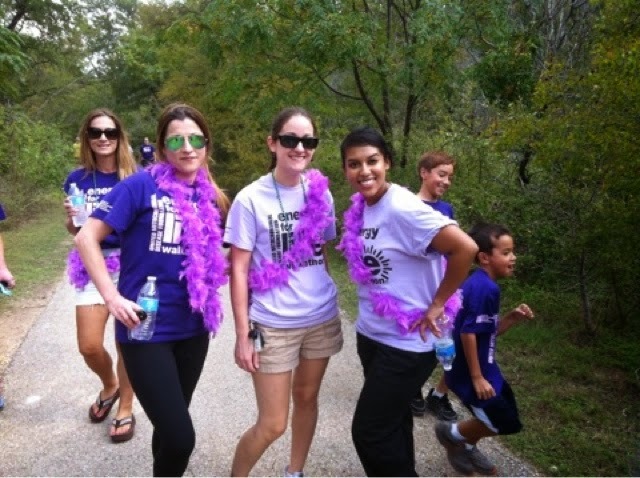 They are always in need of more special needs buddies (there's a waiting list for runners) so please go to this website if you're interesting in taking part in this neat organization. It's actually part of the reason I decided to take up running as well. After watching my dad run for years and then seeing Mike's sister post updates from the couch to 5k program on Facebook and ultimately reading all of the posts from runners on IRun4, I decided to start running! I started 6/1 and have been religiously running or walking every day since! Who do I run for? 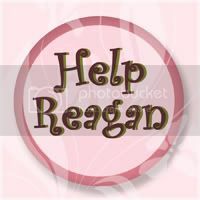 I run for REAGAN!! Reagan woke up once last night, shortly after I fell asleep. She was fussing/crying and not at all happy. I started dissolving a clonidine and then started diffusing some oils (frankincense and copiaba). In the small amount of time it took to get that going, she dozed back off. So I just held the clonidine and went back to sleep. 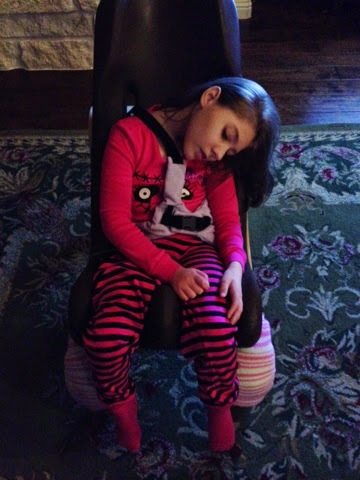 Thankfully, she slept the rest of the night (in her chair, but sleep is sleep)! She woke a little bit after the nurse got here and was serious but calm. That was her demeanor for the rest of the day. At one point I could've sworn I heard a couple little laughs, but her nurse didn't think so. She tolerated her therapies today, and although she wasn't sensitive at all to anything, she also wasn't wanting to participate either. Speech and school were probably the least productive, but OT at least was able to get her out of her chair and stretch her, so I'm sure that was good for her. We also did an afternoon bath, because there was a definite underarm smell we needed to address. Unfortunately, tonight I can definitely smell the "bad day smell" on her head, so she might need another bath tomorrow! All in all, not such a bad day. She made it through without any tears, just tense and serious. Tonight she seemed a little more tense and kicky, but that was probably due to her crazy (napless) brother carrying on about everything! Hoping both babies can get some sleep tonight and wake up feeling better tomorrow! Reagan slept again last night in her bed! She was awake and kicking around at 7:45am, but I'm not sure how long she had been awake. My immediate concern was her seriousness. Very tense in her body, no smiles, very different from the last several days. We were very careful with her to not do anything to set her off. She seemed to be calming down a bit, so while we were at church, her nurse put her in her wheelchair. She even looked like she might fall asleep for a bit, but when we got home we must've made some sort of noise (slamming the door or something)...she flipped out and was full out crying! Not good. We tried everything in our bag...oxycodone, ibuprofen, essential oils...nothing was working! It wasn't until we tried clonidine hours later that she finally stopped crying and dozed off! Unfortunately, that only lasted an hour or so, before she woke up and started crying again! This time we tried Lortab. Thankfully it helped her to doze back off again. This is the first time her new nurse has seen her have a "real" bad day! It's awful. I hate to see her suffer like this and since she can't tell us what's hurting her, we have no clue how to help her! So frustrating! Tonight she was really crying/screaming/moaning nonstop...the medicines didn't seem to be working again. Finally, after a failed dose of clonidine, Lortab helped her to fall asleep! Hoping and praying she can stay asleep and wake up feeling better in the morning! Please say some extra prayers for my girl tonight! Reagan SLEPT last night!! Thank you Lord! In her bed, no less! So glad for her to finally get some sleep! She woke up this morning still sweet and smiling. She's been a good girl today. A little on the spitty side (similar to last night), hands in the mouth A LOT. Some happy vocalizations...but nothing over the top. Overall, she had a good day. Tonight I did smell a whiff of "bad day smell" on her head, despite having freshly washed hair. Not a good sign. I do feel like we've been gifted some extra days...because it seemed she was going to go into a bad streak last week but she never did. Hopefully she'll do the same thing this time? Prayers for my girl! Not sure how much Reagan slept last night. I know I was exhausted from going to bed around 1:30am, so I might not have heard her even if she was awake. She woke me up again around 5am with some vocalizations. I went in and found that when she kicked her weighted blanket off during the night, it somehow managed to pop her tube open, so all night her pump was pumping formula onto the floor as her intestines drained out on the floor as well! Ugh. So I changed her and cleaned up the mess and laid down for 5min til my 5:35am alarm went off! No excuses. I got up and went walking with my running partner (long run is tomorrow). Reagan had another good day today. She was a little more kooky vocal today (and slightly sensitive to us talking), but otherwise good. She had speech this morning and did well with that. She's been doing really well this week making choices (especially with the eyegaze device). Then this afternoon she had "school" and was great with that as well! Tonight she was super sweet and dare I say even sleepy! For the first time in days, we were able to get her into her bed and Mike laid down with her til she fell asleep! Praying for some sleep for my sweet girl! Sorry everyone for the delay in posts. All is still good here, I'm just having a hard time managing my late nights (and sometimes up many times thru the night) and early morning runs. I am SO not a morning person. And although I feel so much better after running in the morning, I'm exhausted from the cumulative lack of sleep! This morning was definitely one of those mornings! And my poor girl, I can't even imagine how tired her little body must be! She's on her second night of little to no sleep, with no end in sight! Thankfully, she's still smiling, so we'll take what good we can get! She only had one therapy today, PT, but she did well with that. She was up in the stander for a bit and just as sweet as can be. This afternoon and tonight she just took it easy. I gave her clonidine tonight and 30min or so later, she did start looking sleepy. She dozed off for maybe 10-15min but woke up when I was connecting her tube feeds (even though I seriously didn't make a peep...I think she could just sense me beside her). She was very vocal and seemed slightly agitated, so I tried giving her some oxycodone, but it didn't seem to touch her. I started diffusing some lavender and "peace and calming" and was rubbing lavender around her head. Finally around 1am I was in the process of looking up what oils I could use for restless leg syndrome (she was kicking around a lot and just couldn't seem to hold still), when she finally dozed off again. I'm off to bed to try to get some sleep! I don't think Reagan slept much at all last night. When I got up this morning I found her all crunched up in her chair, hair hanging all in her face, and hands tangled up in it! What I was pleased to find was that she still had a big smile on her face! I could hardly believe my eyes! I really thought we were in for a rough one today! 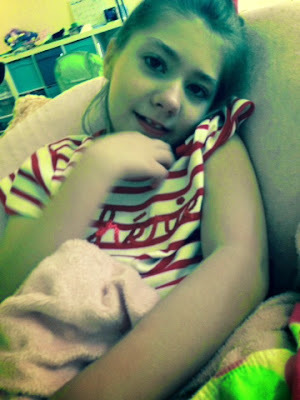 We took advantage of her good mood and she had a busy day of therapies! First speech, then PT, then OT, and finishing off with school! It was quite the day! She only got a little excitable a couple of times, but never to the point of concern. Tonight she was sweet, but still excitable. I think she's in for another all-nighter. You can just tell. Her body is tense and she's amped up...she doesn't seem to be winding down in the least. Poor girl. I wish there were something we could do to help her rest, but when she's like this, she's completely immune to sleep meds. Reagan woke up early again this morning...that's OK though, because she slept most of the day yesterday! She was sweet and still and I was very happy to see her still hanging in there! She had vision and OT (through the school) this morning and she did really well with both. She dozed off shortly thereafter and almost missed OT, but she woke just in time for her therapist to turn the car back around and head our direction! She had a good day today! She was smiley and sweet! Tonight she was even up for going over to my stepsister's house for National Night Out! Reagan was great, Ryan, on the other hand, decided to have a full blown meltdown! I think he was thrown off since everyone was outside hanging out in the culdesac, he's used to going in their house and playing! He eventually settled down and stopped crying when Mike took him out on the trampoline. He jumped nonstop for 45min or so before we were able to get him off! By then it was getting dark, so we left shortly thereafter! Tonight it was late and Reagan was not dozing off, so Mike tried laying down with her. That didn't work. I gave her a dose of clonidine...which made things worse! For the next hour (11:30-12:30) she just got more and more agitated. I tried Lortab and moving her back into her chair...she did calm down, but she's super restless. Unfortunately, I don't think she's going to sleep much tonight! Reagan had another sleepy day today! She woke up this morning bright and early and seemed to be wide awake and ready to go! She was very still and relaxed. She fell back to sleep only moments before her speech therapist got here at 10am (I think she does this on purpose sometimes)! Her therapist came anyway and spoke to the new nurse about things she can work on with Reagan. Then her OT who was scheduled to come at 11:30am, did the same. 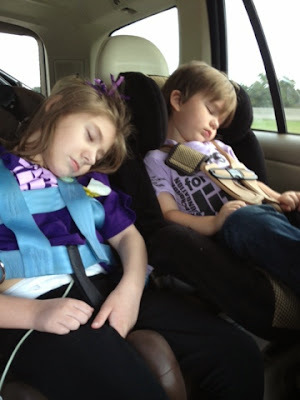 Reagan was still dozing, so therapies just didn't happen! She also slept through "school" and then just kept on sleeping! We transferred her to her bed and she just continued sleeping away! Hopefully she sleeps and wakes up a happy girl tomorrow! Today is her other nurse's birthday...hoping she's good for her tomorrow! It's beginning to look a lot like Halloween! Reagan has had a good day today. She's been very laid back and calm! She's been pretty still all day, but especially tonight. No hands in the hair or hands in the mouth...just a lot of hands by the side (which doesn't happen often). She's still been sweet but not as smiley. The stillness does have me a little concerned, but hopefully she'll hold out and have a good day tomorrow. 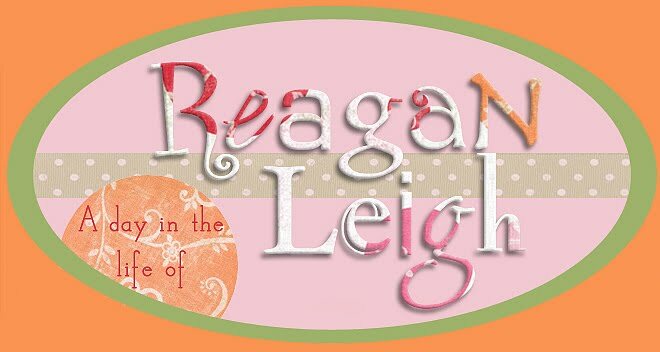 This was her new nurse's first weekend and she's hoping to see Reagan in action tomorrow with her therapies! 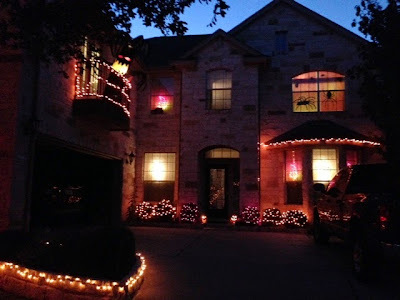 Grandma has been hard at work today decorating for Halloween and both kids enjoyed going outside tonight to look at the festival of lights. 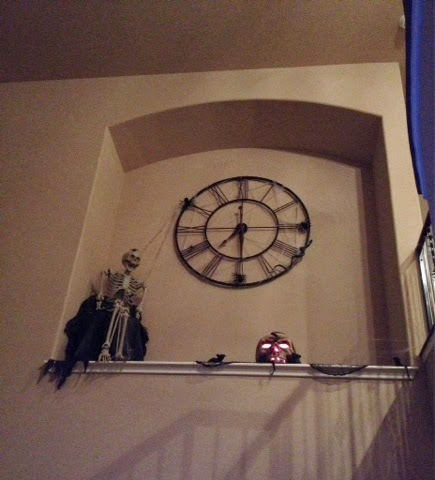 Yes, it's beginning to look a lot like Halloween over here! You could say we go all out (and we've got a lot more to go)! Reagan slept well last night but woke up a little early. I moved her into her chair around 6:30am and then went for my run. She was content though, so that's good, but vocalizing enough for me to know she probably wouldn't have tolerated another 45min of just laying awake in her bed. She was good most of the morning...she had a big liquidy diaper that may have been the source of some discomfort we saw a bit later. She had several mini meltdowns throughout the day (she was very sensitive to us talking and sound in general). Nothing lasted too long, but they all consisted of tears but were fairly easily reversed with some snuggling and coaxing. I think she was just having pain, what kind of pain, I'm not sure. If I had to guess, I'd guess tummy pain, but who knows. Tonight she was really fighting sleep. Her pm dose of clonidine just wasn't doing the trick, she kept dozing off but popping back up! Finally, I gave her Lortab and that seemed to help her doze off. I guess if she's having pain, that might be just what she needed. Hoping for a good night's sleep tonight and an end to this craziness. Reagan slept well last night and woke up a super sweet girl today! She's had a great day! She's been very calm and smiley. Nothing at all seemed to phase her. She had speech this morning and did well with that. Then she just took it easy for a while, enjoyed the nice breeze from her balcony, watched some tv. Then her teacher came and she was great for that as well. 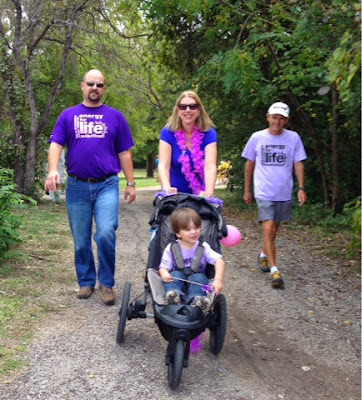 Afterward, we put both Reagan and Ryan in strollers and headed down to the Fall Festival going on at the Elementary School down the road. 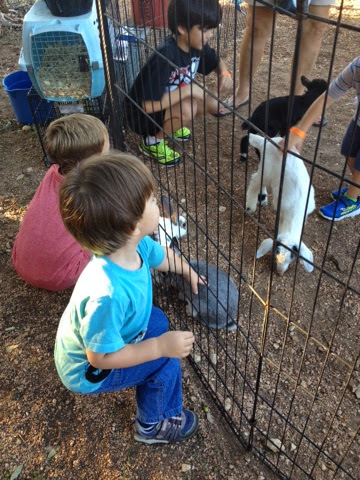 It was a little chaotic, but I think Reagan enjoyed getting out (and since she was very laid back today, we didn't have to worry that sights or sounds might set her off) and Ryan had fun on the playground and checking out the petting zoo. It was a bit of a zoo out there though, so we didn't stay too long. We walked home and got out of the mosquitoes as quickly as we could! Reagan was great all night and dozed off in my arms and transferred easily to her bed. Hoping for another good night's sleep for my sweet girl! Reagan slept last night and woke up much improved today! She did, however, have FOUR large liquidy diapers! The first leaked all over her nurse and the mat she was laying on! The next two were also very leaky but her clothes was the only victim (the first three all happened within a 1.5hr period). The last was the only one that didn't leak! So needless to say, I was doing A LOT of laundry today! I definitely think that might have been part of the reason she was so upset yesterday...tummy pains could definitely do that! She was awake all morning and had really good sessions of PT and OT, but shortly after OT, she dozed off and slept the rest of the day! We went to Bible study and came back and she was still out! Mike managed to transfer her into her bed...so hopefully she'll sleep the night through. Reagan slept the whole night through last night (thank you God) and then just kept sleeping! She slept all morning and then woke right around 12:45pm, but she did NOT wake up happy! She was very stunned/agitated and was trying to bite herself. We gave her some oxycodone, but she continued to full on cry for almost an hour or so until she finally dozed back off. Ugh. What the heck?!?!? Why is she already having another bad day? She's had 3 bad streaks in the past 2 weeks! That's way too many! I know I've been hesitant to make any changes, but it just might be time to try the ketogenic diet. I'm not sure of another good alternative at this point. SO frustrating! She kept sleeping the rest of the day (in her chair of course). We were afraid to attempt to move her, so we left her in her chair overnight. Hopefully she'll sleep through the night and wake up better tomorrow!